Samsung promised that the S6, S6 edge, S6 edge+, and Note 5 would be getting Nougat in the first half of 2017 and it's starting to fulfill its end of the deal now. 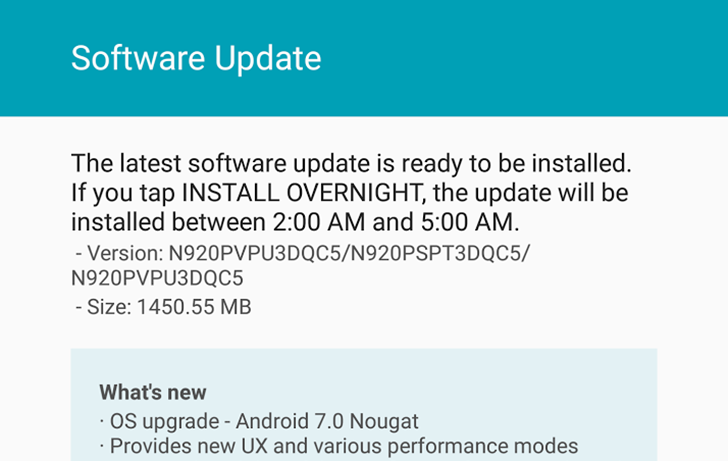 Galaxy Note 5 and S6 edge+ devices on Sprint are one of the first to benefit from an OTA update that takes their devices up to Android 7.0. If you own one of these two late 2015 flagships on Sprint, check manually for an update as it might be waiting for you without having surfaced the notification. And regardless of which one of the two you have, you should expect the OTA to weigh around 1.3-1.4GB so you better be on a fast and unlimited connection to download it. When the update is applied, you have many things to look forward to in Android 7.0, like customizable Quick Settings shortcuts, improved notification control (unbundling and quick replies), Android's multi-window support, and more.